Otters’ Lodge: Beautiful countryside cottage close to beaches and attractions. 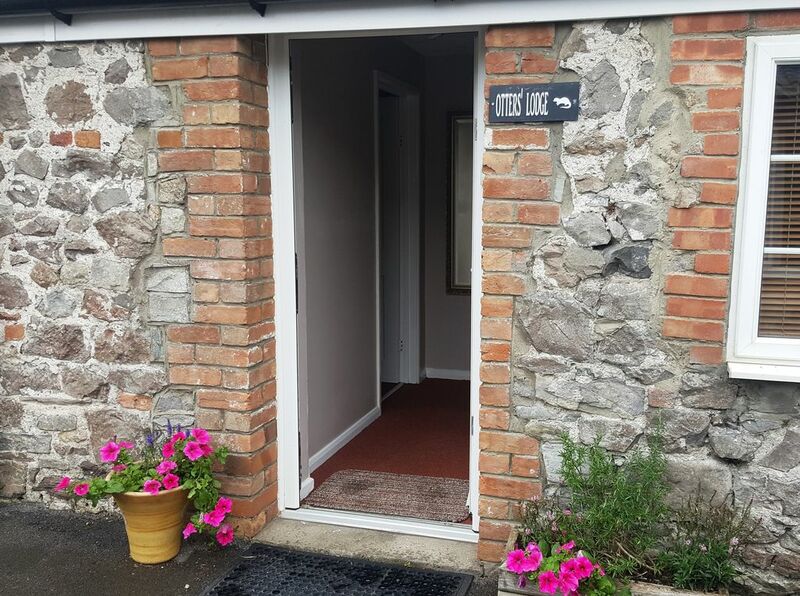 Otters' Lodge is a newly refurbished & decorated two-bedroom bungalow tucked away in the beautiful, peaceful Somerset countryside but close to the popular beaches, shops, restaurants and attractions of Weston-super-Mare, Burnham-on-Sea and Uphill. Accommodation comprises a double bedroom with double bed and bedside cabinets with touch lamps, chair, wardrobe, cupboard and two wall mirrors. This room also benefits from access to the private courtyard. The second bedroom has single bed with trundle to accommodate a fourth guest, chest of drawers, wardrobe, wall mirror and touch lamp. Please note that the listed price is for up to three guests. Use of the trundle bed will result in space restrictions inside the room and so there is only a small surcharge applied for a fourth guest. All beds (including the trundle) benefit from new pocket sprung memory mattresses with Egyptian cotton linen to ensure a comfortable and luxurious night's sleep. Adult guests are also provided with fluffy towelling bathrobes. The well equipped galley kitchen has a large American style fridge/freezer, electric oven/hob, microwave, toaster and kettle and quality crockery, glassware and crockery. The kitchen is located off the dining area which is furnished with beautiful Jali wood furniture, including a table that seats four guests; and the sitting area with two large luxury sofas, table & lamp, floor rug and FreeView TV equipped with a PS3 (Which can be used as a DVD/Bluray player) and a collection of games. Guests can also use the Firestick to access a variety of TV stations and a Bluetooth portable player to listen to music on your phone or iPad. The utility room houses a washing machine with ironing board & iron and vacuum cleaner and leads to the fully tiled, modern shower room with WC and waterfall basin. Egyptian cotton hand & bath sheets/towels and bathrobes are provided for our guests. The private courtyard garden with its beautiful flower border and pots is accessed via the sitting/dining area and double bedroom. Here you can enjoy the comfortable rattan seating with coffee table for three people, with further seating for two people on the Keter bench (which also stores all the cushions). An Outback BBQ is also provided for guests' use to make full use of outdoor living in this beautiful suntrap garden. Private parking is available for up to two cars at the front of the property. Guests can also make use of the free, secure WiFi. The property benefits from storage heating which will keep you cosy on Winter breaks and window blinds in addition to lined curtains. Otters' Lodge has an information pack to provide you with information on your holiday home and details of places to visit during your stay with us, including the local beaches, restaurants & pubs, family day's out, shopping, restaurants and local leisure/spa centres. We want our guests to have a relaxing, stress-free stay with us, so if you need anything or have forgotten to bring anything with you, we are always happy to help! We are mother (Lorrayne) and son (Jake) and we look forward to welcoming you soon to our holiday home, Otters' Lodge. We live in the adjacent building, but fully understand how important it is to leave our guests to fully enjoy their well-earned holiday and to have a relaxed and stress-free stay. But you can be reassured that if you need anything at all, or have forgotten to pack anything, we're here to help! We moved to Somerset from London (where both of us were born - one a lot earlier than the other!) and now consider beautiful Somerset and its friendly people as our home and family; we hope that you will come to feel this way about your holiday home. Otters' Lodge is in a beautiful, peaceful location, surrounded by fields of grazing cows and a short walk or cycle ride in the surrounding area will reveal so many wonderful sights; birds, wildlife and plants. However, we are not at all isolated, being around 5 miles from Weston-super-Mare, Burnham-on-Sea, Brean and Uphill with their long stretches of beaches, attractions, restaurant and shopping. We are ideally placed to visit attractions further afield in Bristol, Exeter and Bath. The property has been recently decorated and furnished to a very high standard with new, luxury mattresses, Egyptian cotton sheets, luxurious bedding and towels. Otters' Lodge is located next to Otters' Holt which provides accommodation for up to 6 guests. The property used to be farm buildings and many of the beams, stone & brick work still remain. For further pampering, it is a short walk to Rookery Manor's Spa Centre or a short drive or cycle ride to the Webbington Leisure Centre with fully equipped gym, steam room and swimming pool. Wi-Fi is free of charge to our guests. Fully tiled with waterfall basin and storage unit. Mirrored wall cabinet. A short drive (3 miles) to the local leisure centre and swimming pool (Centre fees apply). Spa treatments are available at the Spa Centre a short walk away (0.5 miles - Centre fees apply). Welcome packs to suit your requirements can be arranged in advance for your arrival or during your stay. Please contact us to discuss your needs. High quality crockery, cutlery and glassware and a range of pans provided. Seating for four; beautiful Jali dining furniture with placemats and coasters provided. Private courtyard garden accessed from the dining area and double bedroom. Rattan furniture & cushions and a BBQ are provided for guests' use. We want you to enjoy a relaxing and stress-free stay at Otters' Lodge and are here if you need any information or help. Equipment for babies/toddlers can be provided subject to availability. My 2 children and I stayed for 2 nights the property was lovely, clean and well equipped. Nice location very quiet and safe garden for my two year old granddaughter.to play in. Comfortable beds, good shower and surprisingly spacious for a two bedroom cottage with a pretty courtyard space as well. Host, Jake, was always on hand and greeted us in the rain with helpful tips and suggestions. I would recommend this place. Thank you Jake from myself and my boys. Otters' Lodge is located in a peaceful countryside setting, surrounded by fields where you will see the local cows grazing and even one or two newborn calves! We are around five miles away from the shops, attractions and beaches of Weston-super-Mare (including the Grand Pier), the Victorian seaside town of Burnham-on Sea, the yachting/sailing club at Uphill and the seaside attractions at Brean. Ideally located just off the motorway for those wishing to explore further afield and visit Cheddar Gorge, Wells Cathedral, Wookey Hole Caves or the sights and sounds of Bristol or Bath. Surrounded by lush farmlands, you can relax and unwind in the peace and quiet, surrounded by farm animals, local birds and wildlife. Cyclists will enjoy exploring the countryside routes, whilst the more active can choose to visit the nearby pool & leisure centre (3 miles) or why not treat yourself at Rookery Manor's Spa Centre (0.5 miles) with a well-earned pampering session! Otters' Lodge also has an information pack which provides our guests with details of many local (and further afield) attractions, restaurants, and fun days out. Located amid lush farmlands, you can relax and unwind in the peace and quiet, surrounded by farm animals, local birds and wildlife. Cyclists will enjoy exploring the countryside routes, whilst the more active can choose to visit the nearby pool & leisure centre (3 miles) or why not treat yourself at Rookery Manor's Spa Centre (0.5 miles) with a well-earned pampering session! Our local pub/restaurants is just a 5 minute drive away and the shops and restaurants (including Burger King and McDonalds) at the Service Stations are around 15 minute walk away. Rates may be subject to change until booking is confirmed.